Cheryl Bernard headlines 16th Annual Kings and Queens Scholarship Breakfast. 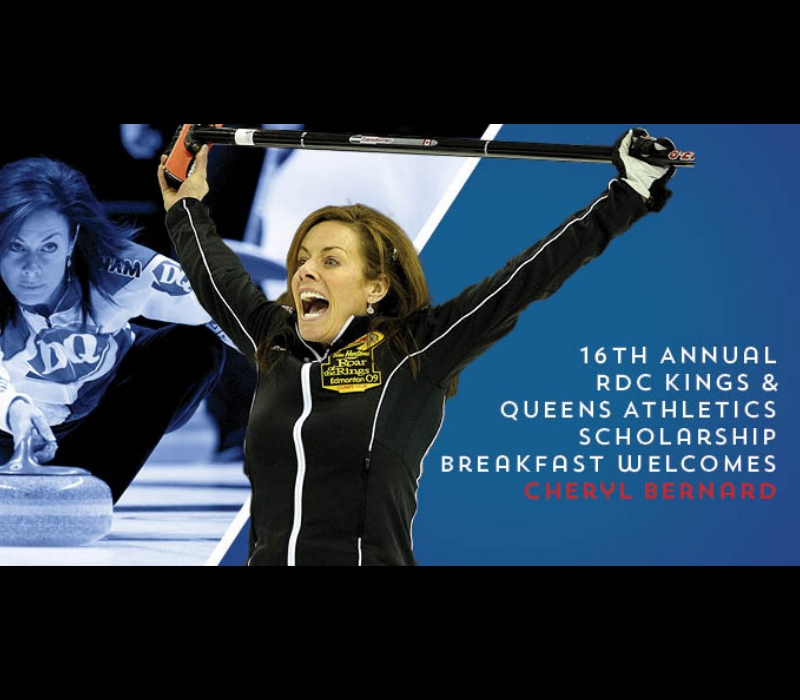 On April 10, accomplished businesswoman and successful Canadian curler Cheryl Bernard will share her message about resiliency, and the power of choice and perspective at the 16th Annual Kings & Queens Scholarship Breakfast. As the 2010 Olympic curling silver medalist and four-time Alberta women’s curling champion, Bernard knows first-hand the value of goal setting. The two-time Olympian is well-known for her accomplishments on the ice but has also had success in business, starting an insurance brokerage at the age of 23 and building it up to a multi-million dollar company. A lifelong volunteer, Bernard also dedicates her time to supporting a variety of non-profit organizations. At the Kings & Queens Scholarship Breakfast, she will inspire audience members to take control of their future and make their dreams come true through strategic planning and making positive choices with her engaging presentation You Hold The Pen. Andrew Jones, a third-year member of the RDC Kings Curling team and 2018 Alberta Colleges Athletic Conference (ACAC) Men’s Curling silver medalist, is especially excited for this year’s event. Jones, co-chair of the RDC Student-Athlete Advisory Council, is thankful how scholarships allow student-athletes at Red Deer College to compete in their chosen sport while receiving a quality education. The Scholarship Breakfast raises funds for the Athletics Leadership Fund which supports the sustainability of the RDC Athletics Scholarship program. Tickets are now on sale for the Kings & Queens Scholarship Breakfast. For more information about the breakfast and Cheryl Bernard, please visit: rdc.ab.ca/breakfast. To purchase tickets online, please visit: rdc.ab.ca/tickets. Miss. 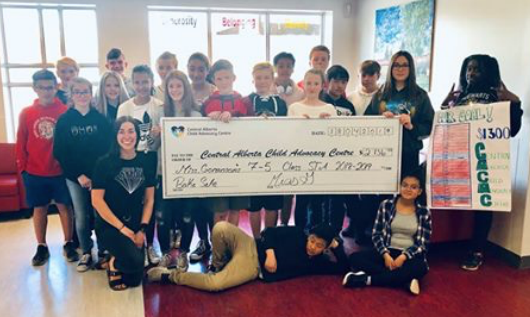 G’s 7-5 class from St. Thomas Aquinas Middle School completed their Almsgiving Bake Sale Thursday with a total amount of $2736 raised for the Central Alberta Child Advocacy Centre! They were so excited to share their news of how much they raised since starting back in March! Every Tuesday, Wednesday & Thursday through out lent, the 7-5’s would bring in treats that they made at home. They sold the goodies to the rest of the student body at lunch to help raise funds to donate to the Centre. Thank you to Miss Goranson for putting this all on for the CACAC, and to the 7-5 class for being apart of this and wanting to help other kiddos – you are amazing! 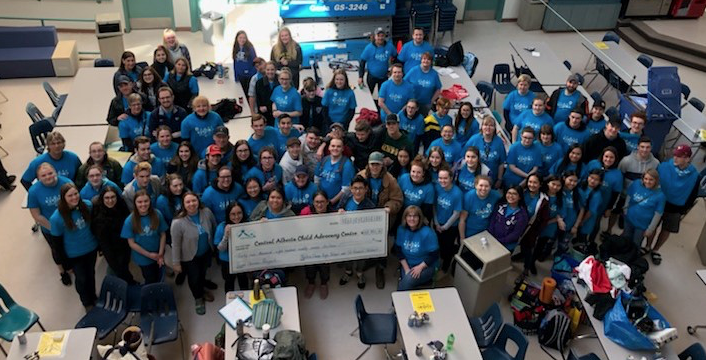 The Grad Service Project at École Secondaire Notre Dame High School to date has raised $45,000 for the Central Alberta Child Advocacy Centre with the goal of $50,000. Each year the graduating class from École Secondaire Notre Dame High School chooses a charity to raise funds for through their Grad Service Project. For the past 11 years, students have raised more than $600,000 for student chosen charities.